Snapchat are currently navigating a minefield of financial woes. Share prices are plummeting, user engagement figures aren't moving in the right direction and virtually every idea they bring in is eventually copied by Facebook. In some sense, they're in a very similar position to the one Twitter was in last year, and just like Twitter, talk of potential buyers has been a key factor, and now a new one has come to light: Google. 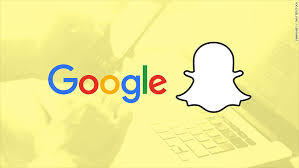 Reports have come through that last year, Google made a $30 billion offer to buy out Snapchat, but CEO Evan Spiegel flatly refused. When the IPO first launched in May, the company was valued at $30 billion but since then that figure has been sliced in half. Since the news about Google surfaced, share prices have risen a small amount, but nowhere near enough to undo the damage done in the last few months. Snap and Google have had a close working relationship for years, Google chairman Eric Schmidt actually acted as an advisor to Evan Spiegel, and even after the huge company failed to buy them out, they still continued to invest in them via CapitalG. At that point, Snap were confident that the IPO launch would go as smoothly as predicted, but in light of current events, they may well need to reconsider being absorbed into Google. That may no longer be an option, though. Currently, Google are working on a news media app called Stamp which allows users to look through articles optimised for mobile reading and tailored to their profile parameters. In form and function, it's very similar to Snapchat Discover. Rarely do companies create a competitive product against another company which they'd been interested in buying anyway. Even if Google did decide to put an offer on the table again, Spiegel has full directional control of the company, so even if his investors steer him towards the acquisition, the final say always comes down to him. Spiegel is an intelligent, canny businessman, but it would take a dire situation to bring him even close to the idea of selling the company. If he continues to avoid clear chances for help, Snapchat will only continue to suffer.